DISCLAIMER: The following article reflects the opinions of the author and is not endorsed by oprainfall as a whole. 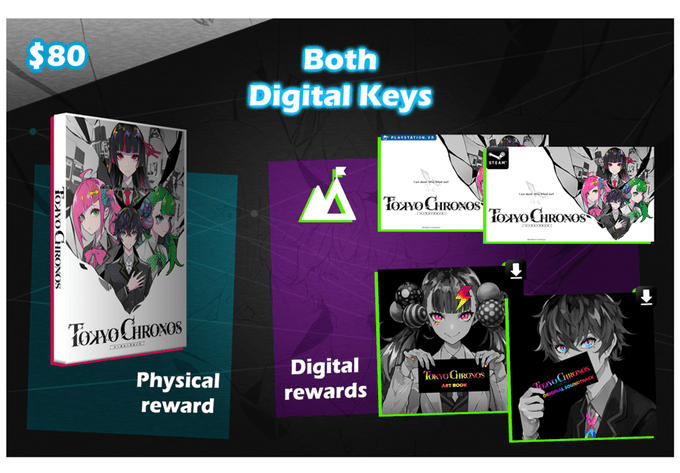 Time for the finale in this trilogy of Tokyo Chronos articles: the Kickstarter itself. Over the last two days, we’ve covered the demo of Tokyo Chronos and taken a look at its development team. Today I want to touch upon the Kickstarter itself and offer a series of recommendations for those of you who are looking to back this project but aren’t sure what to back. Creating backer-tiers is never an easy thing, but some projects do it better than others. How does Tokyo Chronos handle things? Well, we’ll find out but first, let’s touch upon what the goal of this Kickstarter is and what exactly it means to back a project. 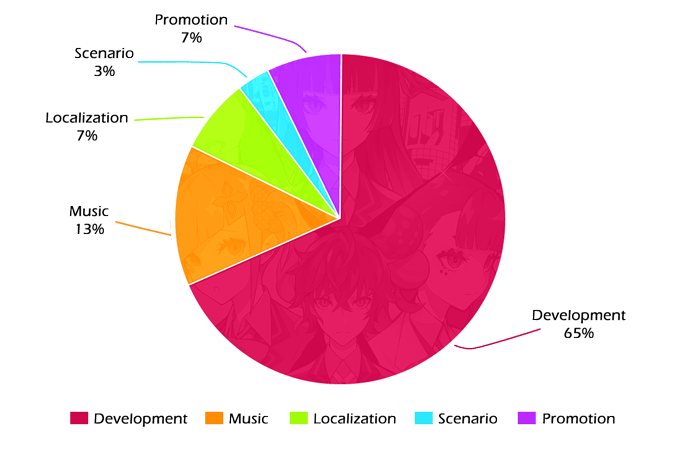 Tokyo Chronos’ goal with this Kickstarter is more about supplementing their own funding than creating a project from scratch. There are two reasons I feel this way. The first is that a demo for Anime Expo was already produced. This signals that the development team has probably completed the preliminary work of the project and just needs some assistance to finish the project and gauge public interest. The second reason is the amount being asked for $75,000. 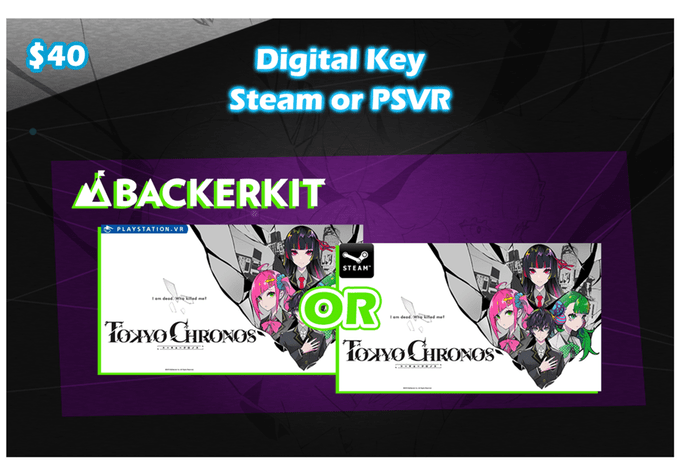 The Tokyo Chronos Kickstarter page. With 1/3 of the money already raised the project is off to a good start. $75,000 isn’t a small amount of money by any means. In fact of the projects I’ve backed, it’s the 3rd highest. The first two being Muv-Luv ($250,000) and Grisaia: Phantom Trigger The Animation ($100,000). On the flip-side, it is more expensive than other Visual Novels I’ve backed in the past. Those being Grisaia: Phantom Trigger Vol. 5 ($30,000) and Koropokkur in Love ~A Little Fairy’s Tale~ ($30,000). Is there a reason for this? I think so. Keep in mind that developing a VR title is more expensive than a standard game of the same length. 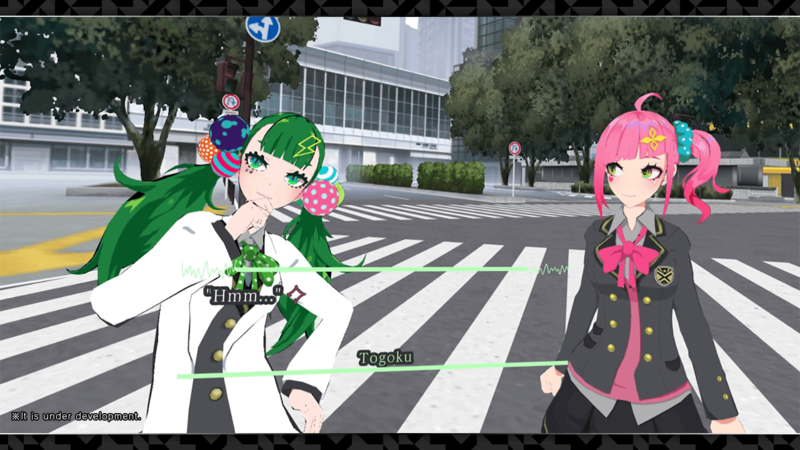 While at the Tokyo Chronos panel during Anime Expo it was revealed that the team is shooting for a playtime of ten hours over eight chapters, that’s still longer than most VR experiences. A game like Skyrim VR being the exception. As such, even while being a visual novel, this isn’t exactly going to be inexpensive to make. So, now that you have an understanding of why the development team is asking for support, let’s take a look at what it means to give that support. The chart which shows just how exactly MyDearest plans to spend the funds raised on Kickstarter. Assuming $75,000 was raised about $48,750 would go just to developing the game. Conversely, $5,250 would go to localization. Let me correct a common misunderstanding when it comes to backing a project via crowdfunding. You are not outright buying something. Instead, what you are doing is investing in a business project. I realize that sounds a lot less glamorous to some people but it’s the truth. Just like investing in a business there are risks here like with any project. What do I mean? Well here’s a list of potential issues. Various rewards could be delayed, changed, or canceled. The release date could be pushed back. The end result may not live up to your expectations. 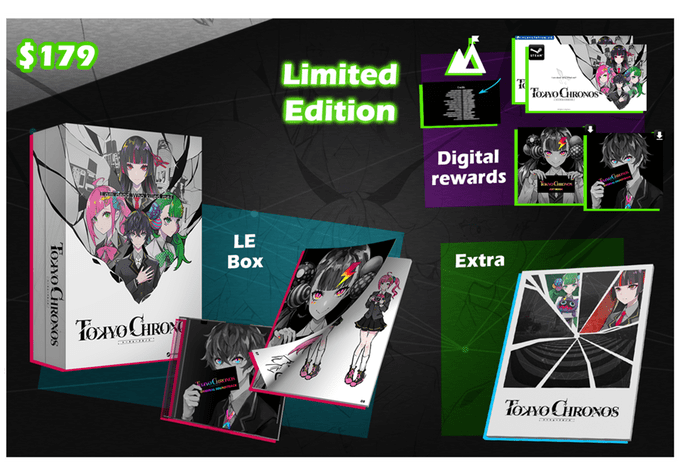 Tokyo Chronos could be canceled entirely. Now, realistically, it’s highly unlikely the game would be outright canceled. The most valuable thing to any company is the goodwill of the consumer. After all, if you lose their trust they will not support you in the future. And I’m sure Sekai Project and Tokyo Otaku Mode do not want this to happen. It doesn’t take a genius like Togoku to know that promising things and not delivering is bad for business. Still, before you invest keep in mind that there are no guarantees things will go smoothly. No major company would willingly support a project if they felt it was going to fall apart. Plus, as I pointed out in my piece about the development team, this isn’t a bunch of newcomers. These are seasoned veterans who I’m also sure don’t want to damage their reputations. Still, before you invest in a project understand that there is no guarantee that you’re going to get what you pledged for. This isn’t a pre-order, its an investment. That said, if you still want to invest, what tier should you give at? Well, a lot of that depends on your own disposable income and what rewards you want. Let’s start with Backerkit. Backerkit is a very useful tool in case you’re not sure how much you can actually give. What Backerkit does is allow you to individually select certain rewards once the campaign has been funded. Think of it as reserving a spot so that later on you can get what you want. The second tier is the $40 Digital key. Not sure how much money you can give? No problem, Backerkit access will let you select rewards once the project is funded. So, it’s a good choice for those who are unsure about their budget. The digital key is pretty self-explanatory. Though it gives us an idea as to what the Tokyo Chronos team values their title at, $40. That’s a pretty decent price for the game, I feel. It’s little much for 10 hours, but for a VR title, I can certainly see paying that much. Especially, if the title lives up to expectations. Take a look at my impressions regarding the Anime Expo demo if you’d like more information on that. The next tier is the $60 Physical copy & digital OST. The second tier gets you a digital key for $40. Not a bad deal and it gives us a clue as to the MSRP of the final product. This is where we start to get into that range where it’s harder to justify. I prefer physical copies and I love video game OSTs. It’s pretty much what makes up the music on my phone. That said an extra $20 for a physical copy is a little up there. If the package gave me a physical OST copy I’d feel better about this. Still, I think this a solid tier if you want a physical copy of the game. The next tier though is where I have a few questions. The $179 Limited Edition. Want a physical copy of the game? 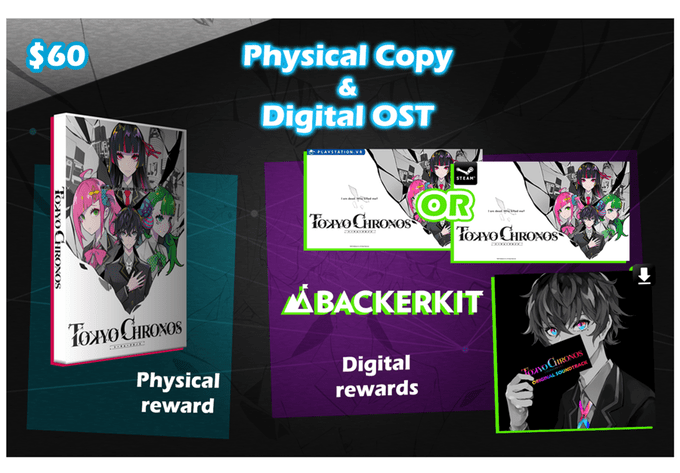 The $60 tier will give that, a digital copy, and a digital OST. This is probably my personal favorite tier for the value. The pricing of this tier confuses me. Most limited editions range between $60-$100. In fact, outside of importing my Neptunia LE’s from Japan, I can’t remember spending that much on an LE. You do get some neat rewards with it, such as the mini-light novel, but it’s still pretty expensive. Honestly, I’d like to see a tier that has the LE box by itself for $80. If I have a physical copy of the game, I don’t necessarily need the extra digital keys. Or at the least, I only need one. Still, these four tiers I think are the main ones people will go for, so what’s my recommendation? The $179 Limited Edition tier comes with a lot of awesome stuff, but the price is pretty steep. This one is solely for the die-hard collectors. If you’re not sure what you can spend but still want to support the project just do the $1 Backerkit pledge. This way you at least have access later on to select the rewards you can afford. Next, if you just want a copy of the game, take the digital tier. $40 is not a bad price, and you’ll probably only play the game on Steam or PSVR, not both unless you’re fortunate enough to have two different VR headsets. Finally, that brings us to the question of the physical editions. This is the hard one. If you just want a physical copy then the $60-tier will work. However, the LE tier requires some careful consideration. $179 is not cheap for anyone. Yes, it’s a very nice exclusive for those that have the money to pledge that much, but for most college students and gamers who have limited income, it’s a bit of a stretch. I’d say, don’t break the bank on this one. Stick to the $60 tier unless you really want those extra rewards. With that analysis complete, let’s wrap this up. I will note that there is an $80 tier that gives you a lot of digital rewards. Still, I’d really like to see a standalone LE at this price. Let the $179 have both physical and digital rewards but give backers a choice here for physical or digital. Tokyo Chronos is shaping up to be an interesting and ambitious game. One that I do have faith in seeing the light of day. That said, great consideration should be taken when pledging to any Kickstarter. Remember, it’s an investment, not a purchase. You’re putting your faith in the devs and expecting rewards as a result. Which doesn’t always happen, so invest responsibly, please. Still, it’s a project that I think does deserve support and I plan to do the same myself once I double check my own post-Anime Expo finances. As for what tier? Well, I’m still debating between the $60 and $179 tiers myself. But I’m sure you’ll be able to find a set of rewards that fit your personal tastes. Tokyo Chronos is due out in early 2019. Please take a look at the trailer and be sure to check out our other two articles regarding the demo and the development team.